Bentley announced Monday that its redesigned Continental GT and GT Convertible will soon be available with a twin-turbo V-8 rather in addition to the brand's quintessential W-12 engine. Freshly redesigned, the third generation of Continental GT was launched in 2018 with only a 6.0-liter twin-turbo W-12 as an engine option, though in keeping with past Continental GTs, the V-8 isn't far behind in terms of performance. Like the last GT's V-8, this 4.0-liter unit sports twin turbochargers in a "hot V" configuration for tight packaging and minimal lag. It's an engine similar to the one used in the Lamborghini Urus, another ultra-premium model built under the vast umbrella of Volkswagen-owned companies. At full boost, these turbochargers allow the Continental GT V-8 to lay down 542 horsepower and 568 pound-feet of torque through the car's all-wheel-drive system. Zero to 60 is reached in a mere 3.9 seconds for coupes, or 4.0 seconds for convertibles, which is approximately 0.25 seconds slower than the W-12 model that our very own Will Sabel Courtney recently tested. Bentley says both are capable of storming all the way up to 198 mph—given you have a continental amount of road to safely reach that speed. Like any other road car, the Continental GT V-8 can calm down and serve as a comfortable cruiser when not asked to travel at full tilt. The V-8 itself is equipped with cylinder deactivation, and programmed to run stop-start aggressively at low speeds, coasting the car to save fuel in traffic. Passing time in said traffic can be done with the GT's ten-speaker, 650-watt premium audio system while toying with the supple leather 20-way adjustable seats. These pair with a continuously self-adjusting damping system and optional air suspension to make the GT V-8 as comfortable on every part of the body (except tired eyes, as The Drive's Mike Guy found) as its W-12 contemporary. Not everyone wants to insulate themselves from the outside world in sumptuous luxury, of course, which is where the convertible GT V-8 comes in. Its automatically folding roof can pop up or shrink away in 19 seconds at speeds up to 30 mph, and being ever so British—where the GT is designed and built—the convertible roof can be ordered in tweed. 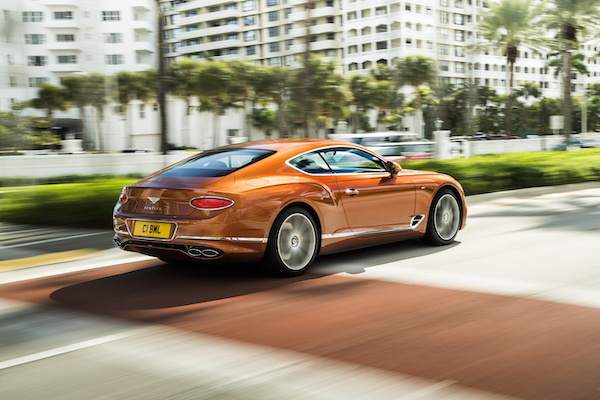 Unfortunately for Britain itself, it won't be the first country in which the Continental GT V-8 rolls, with its ten choices of wheels, ranging from 20 to 22 inches, as Bentley has selected the United States as the GT V-8's first destination. Deliveries will begin in the third quarter of this year, and the rest of the world in the first quarter of 2020. Pricing has yet to be announced but is expected to land somewhere north of $200,000.